There is a parenting resolution that we think it is worthy to consider making, and that would be that all of your children have devotions. How many of you have trouble consistently having your own Quiet Time? To teach your children to do so at a young age will be giving them a wonderful gift for their entire lives. Even infants love to listen to their mommies tell them a story and sing to them. 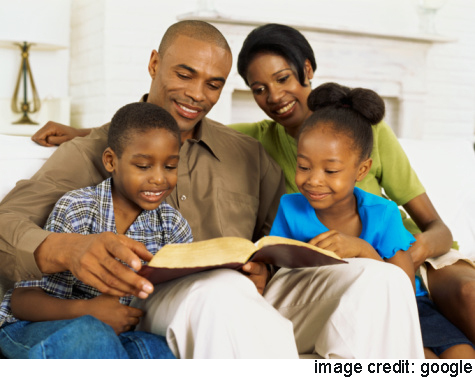 If you have children under 5 years, set aside a time each day to read to them from an age-appropriate Bible or devotion book, sing a song about God and pray with them. How long will this take? The only way to make time for it consistently is to do just that, plan a time in your schedule when you know you can do it. Given their attention spans, a few minutes at most is all that is needed. When our son or daughter-in-law tell our 19 month old grandson it is Bible Time, he hurries to a certain chair, picks his Bible Storybook off a table and hands it to his parent. Children in Kindergarten – 2nd grade will still need to have their devotions read to them. Get a notebook and write down their answers to the questions at the end of each day’s lesson and their prayer requests. Be sure to write down the answers to these requests too! Can you give up ten minutes a day to help your child with this? When kids reach 3rd grade and above, have them start their day by having devotions on their own and write down their answers themselves. After dinner on Saturday nights, Joey would have our kids get their notebooks and Bibles and would invite them to come and share with him what Jesus taught them in their devotions/Quiet Times that week. Our children looked forward to this time with their dad. Take the time now to start your children in the habit of daily Quiet Times with God if they do not already have them.